As I have said previously, the main material used is pure carbon, so, I have used a pure carbon 6 mm diameter rod (see the analysis certificate below). To get a free g rays source to initiate the main reaction, I have used a Thoriated Tungsten rod (6mm diameter) with 2.20% of ThO2. 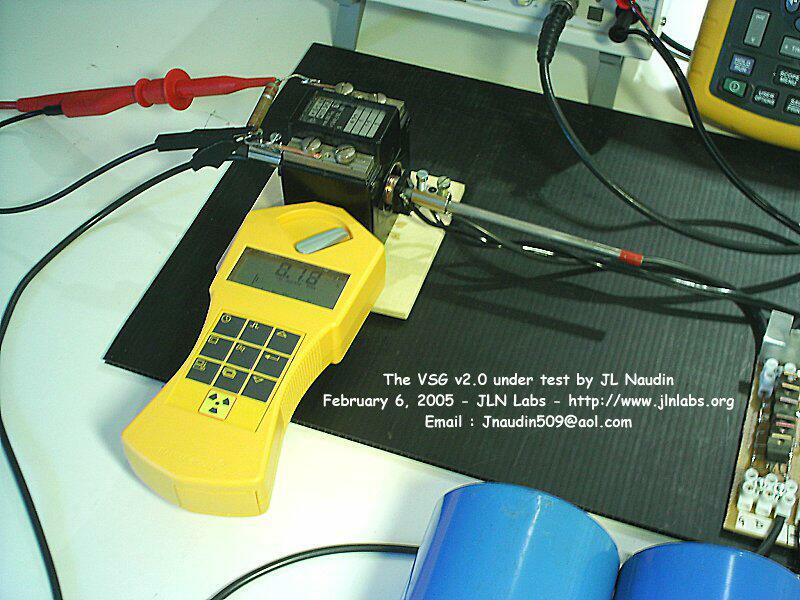 A radiations counter is able to measure 0.46 µSv/h while the ambiant level is 0.10 µSv/h. A such electrode (WT20) is commonly used for TIG and Plasma welding and I have alredy used it previously in the High Temperature Plasma Electrolysis experiment (CFR project). The Carbon and the Th-Loaded Tungsten rod assembly is inserted in the axis of a cylindrical coil. 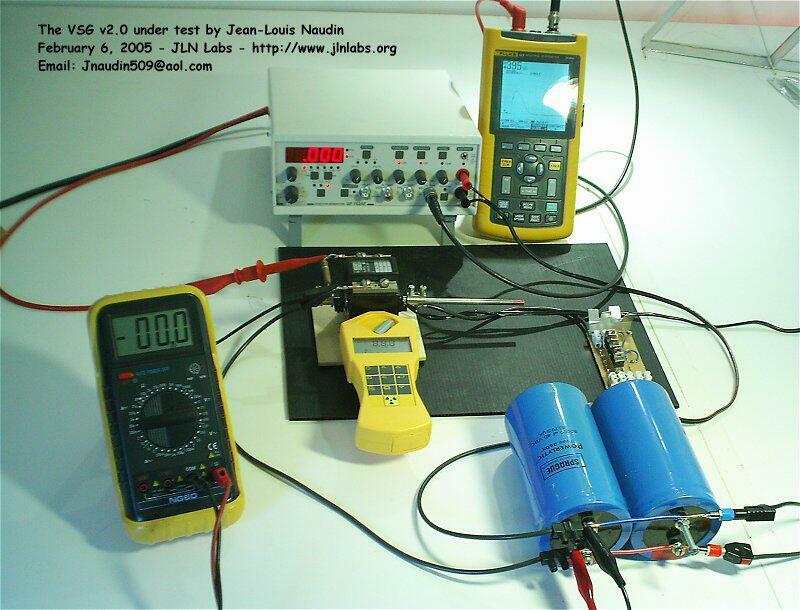 The current pulse is measured by a current transformer (400:1) loaded with a 881 ohms resistor. 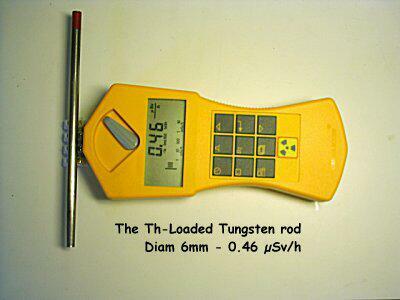 The nuclear reaction (if there is one...) is monitored with a radiations counter. I have used a Gamma-Scout® handheld radiations detector.The Gamma-Scout® reliably measures alpha, beta, gamma and X-radiations, it is the latest development in handheld Geiger counters, designed specifically for homeland security. 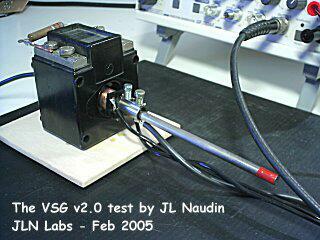 Below the main schematic diagram of the VSG v2.0 tested in this experiment. The two 80000 µF capacitors are fully charged at 37 V.
The function generator sends a squared pulse to the High Power MosFET switching circuit. The capacitors are discharged through the 0.051 ohm resistor and the VSG unit. The strong pulse of current is trapped with a current transformer loaded with a 881 ohms resistor. The voltage accros the resistor is measured with a Shielded Test Lead STL 120 ( 1:1, 1 Mohms/225 pF ) and recorded in real time by the digital oscilloscope Fluke 123. The radiations counter is checked for some eventual nuclear reactions. Two tests have been performed, the first (blank) test has been conducted without the B-Field, the second test has been conducted in presence of a colinear B-Field produced by the long coil placed around the rods. The B-Field produced by the coil is continuous. Below, you may see the recorded voltage accross the Rload resistor with and without the B-Field. In these scope diagrams, you may notice that the current pulse is stronger when the colinear B-Field is activated (red curve). During these VSG tests the radiations counter has shown a net increase of the radiations level when the colinear B-Field is used. It is interesting to notice that the measured radiations remain at least 10 seconds after that the short current pulse has been sent. This increase of the radiation level when the conditions are gathered shows that a nuclear reaction seems to occured. Comments : These tests of the VSG v2.0 are very interesting and need to be developped deeply. If the effects measured during these tests are not a simple measurement artifact, they can be directly related to the Prof R.L. Vallée Synergetic theory and thus, this can be a real breakthrough and opens a new path in free and clean energy production.